Logger Location, Sales Order #, Packing List, ect. The Deluxe Thermochron Kit is intended to make working with the Thermochron and Hygrochron data loggers as fast and intuitive as possible. This kit comes with you choice of two Thermodata software packages that are designed specifically for working with Maxim's Thermochons and Hygrochrons. 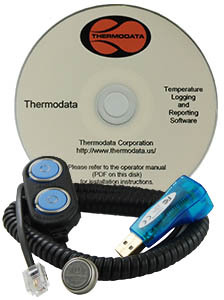 The kit includes the necessary computer interface equipment needed for connecting the data loggers to a pc. Also, included is your choice of 4 data logger models.